Haven't posted in a while as I am currently studying for a degree in Electronic Systems Engineering. It is taking up a lot of my spare time! However, I recently bought a new DVM and I spent a bit more money to buy a true-RMS reading instrument. It should read the r.m.s. 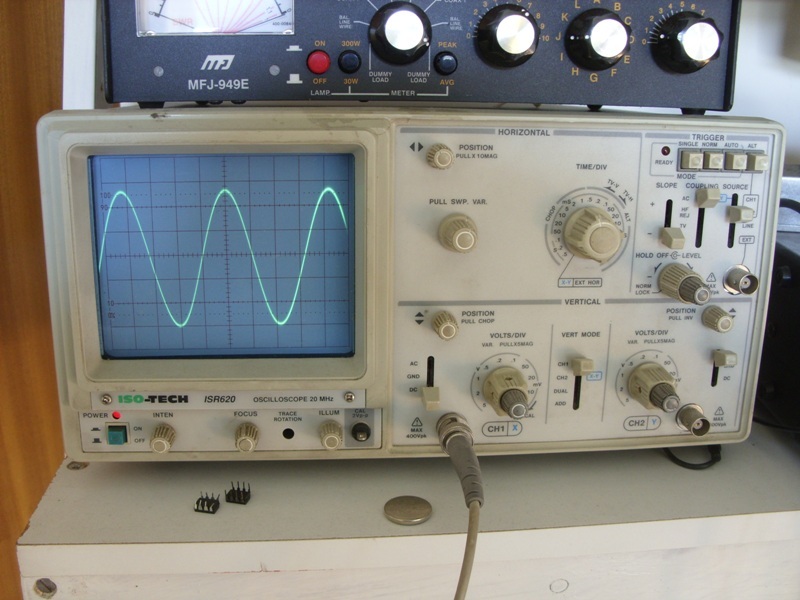 value of an alternating signal, regardless of the shape of the waveform. Cheaper models will only read accurately with a pure sine wave. There are limits to everything, and maximum frequency is one of them. 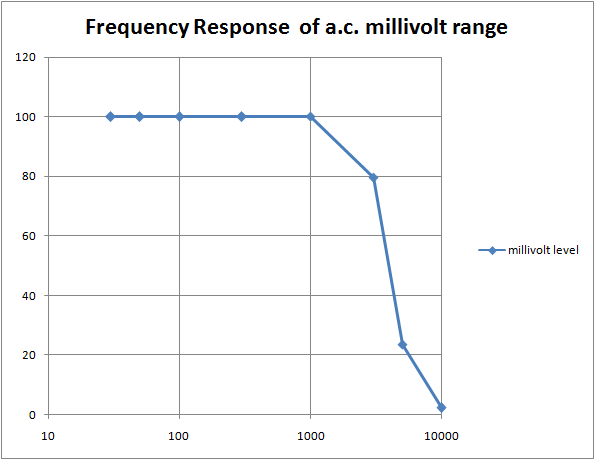 I wondered if the meter would be any good as an a.c. millivoltmeter for making audio measurements. The frequency response was not quoted in either the advert, or the instruction book, so I thought I would measure it for myself. 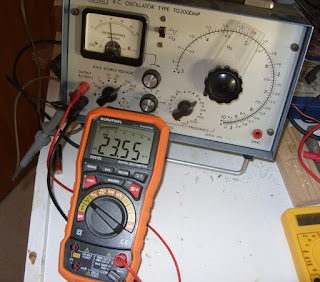 To do this I used my Levell RC Oscillator, which is a vintage piece of gear, but still works well. Also hooked up the oscilloscope across the terminals to check the output level. 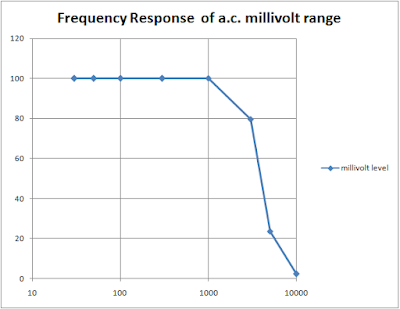 I set the Levell Oscillator to 50Hz and adjusted the output until the meter read exactly 1.000 Volts on the a.c. Volts range of the DVM. The 'scope had a nice sine wave with an amplitude of 5.7 divisions, peak to peak. 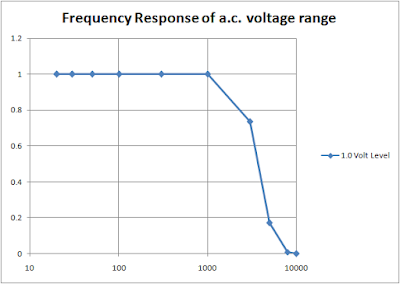 On the 50mV range, with a x10 probe that works out as 2.85V p-p. Divide by two to get peak, then, divide by square root of 2 to find the rms, and it works out at 1.0076 - that's not bad. So I tried different frequencies, checking the amplitude was constant on the 'scope. The results are plotted here. 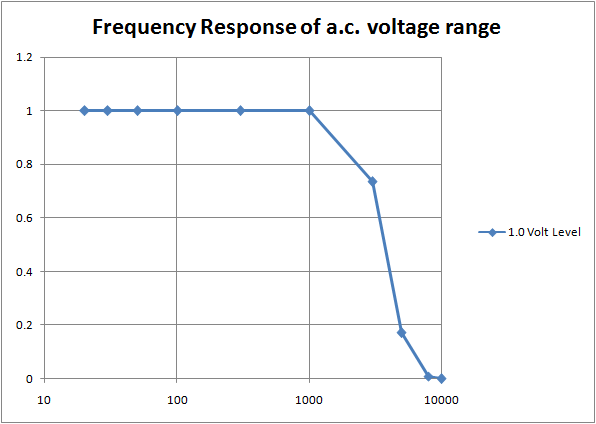 I didn't use the "smoothed" curve in Excel, because it puts in an artificial hump at 1kHz which isn't really there. Joining the dots with straight-lines doesn't look as pretty, but is probably more accurate. Then I reduced the output to 100mV and did the same test using the mV range on the meter. On both ranges, the meter has a flat response up to 1kHz and then drops off quite sharply reading almost nothing at 10kHz. 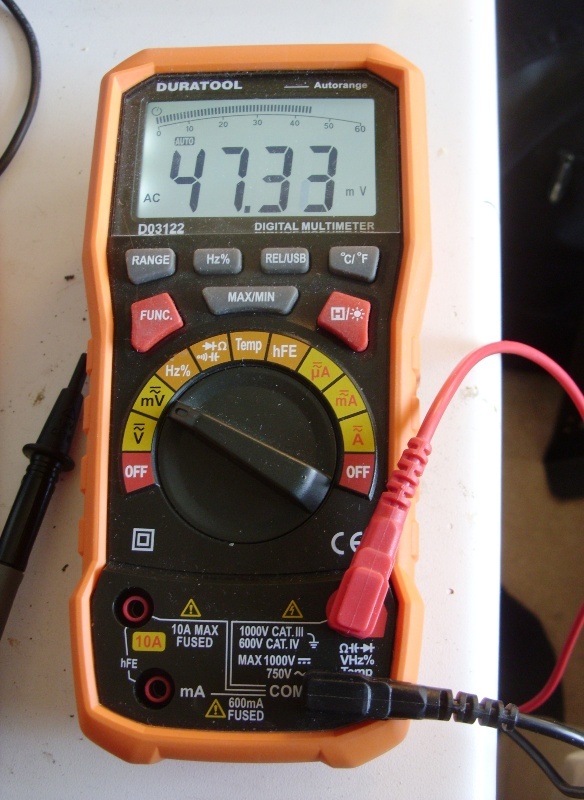 So I conclude that it is good for power frequencies, and even for measuring impedance at 1kHz as part of a bridge or potential divider, but it is not much use for general audio use - I'll stick to using the 'scope. This blog post is not intended to be a full review of the product, and I should probably also say that I'm NOT being rewarded in any way for this post - just want to share the information. The meter is very versatile. It comes with a thermo-couple temperature probe. It also has a USB data output feature which I haven't tried yet. I also like that it has a big display and a backlight. It will be a useful addition to the work bench, and hopefully last as long as my last one (30 years+)!